Luxurious Getaway Safari in Northern Tanzania! On this safari, you'll start in either Tarangire National Park or Lake Manyara before spending three days in the Serengeti National Park following the movements of the wildebeest migration. You'll then finish your drive in the Ngorongoro Conservation Area. There's no better way to see the great wildebeest migration in action and see the amazing parks that have made Tanzania so famous. Come and see for yourself the majestic Africa! Children from the age of 2 years are allowed to participate under the supervision of a parent or guardian. English speaking guide is included in the price. It is also possible to request: German, French, Spanish, Italian, Chinese speaking guides for an extra cost of 80 USD per day. The accommodations for this safari are as follows: Lake Manyara Park / or Tarangire National Park: Lake Manyara Kilimamoja Lodge, Serengeti National Park: Serengeti Acacia Camp, Ngorongoro Crater: Ngorongoro Oldeani Mountain Lodge. Nested on the rim of the great African rift valley with stunning views over Lake Manyara, Mount Meru and on a clear day, Mount Kilimanjaro. The lodge is set on pristine lush green gardens and local vegetation with over 130 species of bird. Sitting around the outside fireplace watching the sun setting over the Great Rift Valley and listening to the humming of the birds the background is a fitting way to end the day, and preparing you for your sumptuous dinner feast. Serengeti Acacia Camps are centrally located in the Serengeti. These camps are the epitome of a real African safari experience whilst maintaining a sense of luxury and style. It offers world-class amenities and facilities that you can enjoy with every second of your stay – from cozy outdoors and wildlife breeze to a relaxing, or romantic if you may, lounge and restaurant. At the end of every thrilling game drive, you can be sure that a comfortable suite and an invigorating environment await you – with all the action just within your reach. Luxury lodge situated on a picturesque hill with spectacular views onto Oldeani Mountain and The Ngorongoro Crater Rim. The lodge is elevated with 360-degree views that extend all the way to Lake Eyasi and Lake Manyara. The property is set on 40 acres of pristine lush green gardens and local vegetation with over 130 species of birds. Today, you will set out on your journey through the lush highlands where corn, coffee, and wheat grow, to travel to the Serengeti National Park. Serengeti, named by the indigenous Masai people, means “endless plains”, which is easy to see once the grassy savannah stretches out before you with no end in sight. The landscape is dotted by kopjes, bizarre rock formations, on which predators often are found surveying the region in search of their prey. 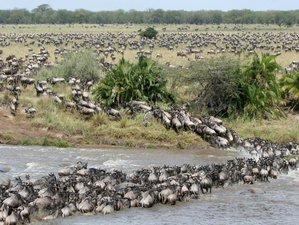 The Serengeti is home to the largest animal migration in the world and depending on the season you will be able to witness thousands of wildebeest and zebras trekking through the Serengeti and Masai Mara Game Reserve in search for food. In the late afternoon, you will arrive at Serengeti Acacia Camp in the Seronera Valley, where you will stay the night. Today, you will explore the Serengeti National Park. Your guide will take you closer to where the migrating herds are to be found. During the short rainy season in November and December, the herds make their way from the hills in the north to the plains of the south, returning north during the longer rainy season from April to June. Their exact location differs yearly as they migrate according to the rainfalls, but your guide will know where you will be able to see them best. Lurking close by you might even spot some leopards, cheetahs, and lions. After an eventful day, you will return to your Serengeti Acacia Camp in the Seronera area for your evening meal and overnight. After an early breakfast, you will head out for another game drive in the Serengeti. You might be able to spot the “big five”: lion, elephant, buffalo, rhino, and leopard before embarking on your journey to the Ngorongoro Crater. The animals roam freely through the unfenced reserves offering you an uninterrupted game viewing experience. Arriving at the edge of the crater, you will have your first glimpse of what awaits you the following day: glistening streams, open grassland, and an infinite amount of animals. You will spend the night at a Ngorongoro O'Ldeani Mountain Lodge with the orange glow of sunset surrounding you as you drift off to sleep. Early in the morning, you will head down the forested slopes into the crater on a steep and narrow path. The crater floor is covered in open grassland with the occasional acacia tree and two small wooded areas. Teaming with wildlife, you will be able to see many animals in a short period of time and might even be able to tick the “big five” off your list. Other animals present in the crater area include wildebeest, zebras, gazelles, warthogs, hippos, and more than 500 species of birds. You will spend the entire morning exploring the park and after a picnic lunch in the crater, you will return to Arusha where you will arrive by early evening. This safari will take place in Lake Manyara Park or Tarangire National Park, Serengeti National Park, and Ngorongoro Crater. Daily breakfast, lunch, and dinner are included in the price. Please book your flight to arrive at Kilimanjaro International Aiport (JRO). Transfer from and to the airport is included. Kiliholidays Tours & Safaris will pick you up from the airport. There is a single supplement for solo travelers of 90 USD per night. Please send an inquiry for more information. The prices below will have a special discount of 700 USD as part of a special spring promo valid till May 31, 2019. To learn more about the prices send an inquiry today!